This is me just before I began cleaning house in a makeshift crop top and leggings. Had you asked me six+ years ago to wear a crop top, I would've shut you down immediately. 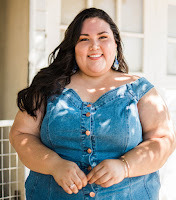 Now, after blogging, YouTube, and adventures in self acceptance, self love, and body positivity, I will happily AND comfortably wear whatever the hell I please. Loving yourself, mind and body, is one of the most rewarding things you can do in life. It isn't easy. It's a journey filled with peaks and valleys, but it's one worth taking. You know what else is worth doing? Wearing a crop top. These things are so fun! *prances around house, showing belly* I wish I would have worn one sooner.